Originally published in Singapore Tatler, November 2015. Words and photography by Melanie Dunea. “I love you,” I blurt out after the perfect spoonful of tortellini en brodo passes between my lips. The man sitting opposite me, the third-generation owner of Trattoria da Amerigo dal 1934 in Savigno, an Italian village famous for its white truffle festival, isn’t sure what I mean. I point my fork at the dish; Alberto Bettini smiles and nods. I’ve been to this region of northern Italy, Emilia-Romagna, many times in the past year, a period when I was very much in love with someone. But that ended peaceably, and I’m now returning alone. What is becoming clear to me is that it wasn’t just my personal relationship that rendered this place so magical. I’m drawn to the food of this place, to the people—to the Emilia-Romagna region itself—with an intensity that surprises me. And I love this sumptuous tortellini en brodo. Now, I’m from the US Midwest, and we Midwesterners don’t pepper our talk with words like “love” and “sumptuous” willy-nilly. It’s not that I don’t appreciate a spritz of glam as much as the next woman. But Midwesterners, as a rule, aren’t known for being easily dazzled. That could be one reason why, before my first visit to Emilia-Romagna—a region sandwiched between Milan and Florence and anchored by Bologna—my relationship with Italy had been, well, rather undazzling. I now admit to having been what I think of as a Prada zombie: Ooh, the clothes, the architecture, the art! Like most tourists, I had visited Tuscany, Capri, the Amalfi Coast, Florence and Milan, and while all are lovely, I was left with a standard boilerplate impression of Italy. Beautiful? Absolutely. Love? Sumptuous? No, not so much. It wasn’t until I visited Emilia-Romagna that I fell for Italy hard. Mostly, it was about the food—and the people who make it. One of the first places I dined in the region was here, at Amerigo, a charming restaurant that’s been serving the specialities of Emilia-Romagna in a rustic, traditional manner since 1934. I had met Alberto then and, as now, we shared bite after bite of tagliatelle al ragu, perfect salumi (cured meats), prosciutto, mouth-watering tomatoes and pieces of tigelle (a small round flat bread, slathered with a gelato of parmesan and drizzled with balsamic vinegar). I actually felt as if I were tasting the love with which the meal had been created. While we absorb glasses of homemade Amari digestifs, Alberto describes what I’m beginning to intuit just by eating. “Our approach is to be open-minded and use local ingredients. We respect time, tradition, nature and the changing seasons.” His gestures grow more animated as he speaks about the care and effort of the hardworking people producing the cuisine of the region—the salumis, prosciutto di Parma, Parmigiano-Reggiano cheese, balsamic vinegar and the many varieties of delicious, freshly handmade stuffed pastas. A quick word about those pastas. The pasta course in this region is non-negotiable; you must eat it. You wouldn’t want to deny yourself anyway. In Emilia-Romagna, the creation of pasta fatta a mano, or fresh, handmade pasta, is as much a sacrosanct, ancient ritual as it is an absolutely precise science. And it is almost entirely a world of women, usually the hawk-eyed grandmothers, the nonnas. So when Alberto suggests I make the trip to Bologna to look up a certain sfoglina, or pasta-maker, to teach me some skills, I’m keen. I have a few days to kill before a lunch date at Osteria Francescana in Modena, reputed to be the best restaurant in Italy, so an in-home pasta fatta a mano tutorial in Bologna is just the thing. As I drive my oversized rental car along the impossibly twisty roads, each hairpin turn invariably reveals another stunning view. The raw, peaceful scenery looks to me as if the countryside of the US Midwest has fallen for a warm harvest moon and decided to call Emilia-Romagna home. No wonder I feel so strangely yet happily at home. I throw my bags down at the Grand Hotel Majestic “gia Baglioni”, Bologna’s only five-star hotel, salute the spirits of former guests Pavarotti and Princess Diana, and head off to find Francesca, Alberto’s sfoglina, passing medieval towers, warm-coloured university buildings and ancient arcades on the way. But when I arrive, the strict, no-nonsense nonna I’m expecting to find is nowhere to be seen. Francesca couldn’t be a day over 25, is lovely and, of all things, easy-going. As she hands me some flour and three room-temperature eggs, she encourages me to go with the flow. “Making pasta is like dancing,” she says. “Just use your whole body.” We use forks to slowly combine the eggs into flour. We twist our fingers to make tortellini (small stuffed pasta pouches), tortelloni (larger pouches and also stuffed) and cappelletti (little hats). Lulled by her sensuous directions, I roll my dough off the table and onto the floor. Had she been the nonna I’d anticipated, I have no doubt I’d have been kicked to the kerb for my sin. But Francesca just laughs, picks it up and we resume working. She’s a new generation of sfoglina: progressive, forgiving, more intent on the love of creating than on following strict rules and regulations. Afterwards, it’s time for wandering—and more eating. I make my way to Salumificio Franceschini, which has been selling homemade salumi in Castello di Serravalle, west of Bologna, since 1964. As I nibble on a juicy slice of salamella bolognese, Simone Franceschini, the young, hip grandson of the original owners, is tight-lipped about the recipes. “Our creations are based on generations of stories,” he says with a wink. The tiny, stark storefront is piled with fresh prosciutto di Parma, cotechino and pancetta. On my way out, I buy 10 strolghino salamis: sweet, very thin sausages of pork and ham. I peel the skin off one and eat the entire thing like an apple. It’s the best salami I’ve ever tasted. Making my way to my date at Osteria Francescana in Modena, I drive by beautiful organic farms with cows and rows of vineyards rolling up and over the undulating countryside. I pull over to take a few pictures and breathe in the views. And then on to my next stop, the Hombre organic dairy farm. Emilia-Romagna is the birthplace of Parmigiano-Reggiano cheese and, by law, the only place in the world allowed to make and sell it under that name. Hombre has been making one of the best organic Parmesan cheeses for more than 50 years. When I turn up uninvited, the owners wave me in. Genuinely pleased by my interest in their work, they allow me to peek in at the cows being milked, classical music crooning to them in the background. Thirty-six-kilo wheels of cheese sit ageing in rows like imperious nonnas presiding over the factory. When I comment on how orderly and peaceful the operation seems to be, the owners shrug: “Our blood is a mix of blood, spirit and this land.” Heartfelt, hardworking, to the point. Again I feel that Midwestern chime. I buy a triangular sliver of Parmesan and eat it in the car. The need to taste the region’s balsamic vinegar drives me onward. Used on potatoes, strawberries, even on cheese, balsamic vinegar is one of the most prized delicacies of Emilia-Romagna and the staple condiment for almost everything. Official certification of origin guarantees that the vinegar, aged for more than 12 years, is among the best. I arrive at Acetaia Villa San Donnino, following a tip that this is the place to sample the perfect “liquid gold”. As the gates slowly open and I drive down a tree-lined driveway, I understand why Bertolucci chose this location for the opening scene of his film Novecento. Magnificent, stately. Inside, owner Davide Lonardi takes me through room after room of wooden tubs, explaining the scope of his vinegars’ creation—from harvesting grapes to pressing to fermentation to ageing. I listen, sort of. Honestly, I’m practically swooning as he indulges me in sips straight from the barrels. Finally, my lunch date at the celebrated Osteria Francescana arrives. 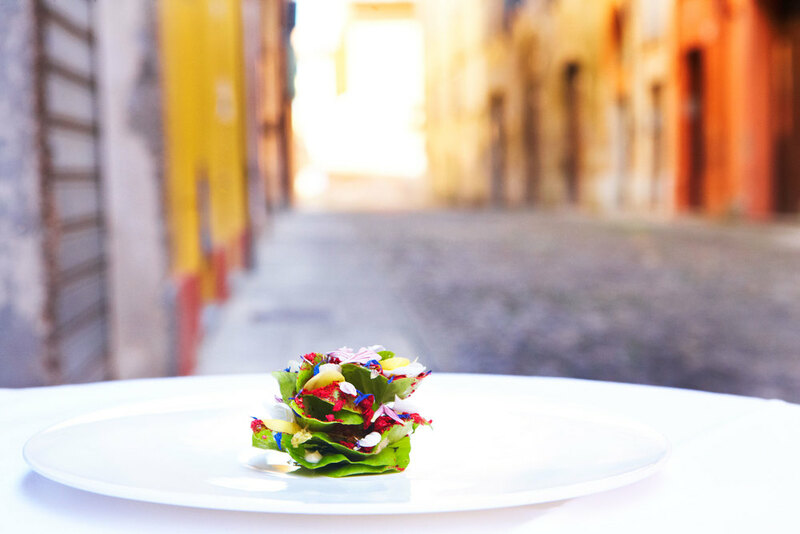 Chef Massimo Bottura and his wife Lara are largely responsible for putting Emilia-Romagna on the culinary map. “Open, warm, social, caring, respectful, traditional and hardworking,” is how Massimo describes his town, restaurant and region to me. It is difficult to keep up with Massimo as he never stops, darting from the kitchen to the dining room to the cellar and to the streets just before service begins, as I pant along behind. Massimo invites me to have dinner at the restaurant. As I’m about to be seated alone at a table, an American couple walk in, hoping they can be squeezed in as they are celebrating an anniversary. Having spotted a table in the wine cellar earlier, I offer to eat there instead, as the prospect of sitting solo in a dining room heaving with couples is feeling a little bleak, while the intimacy and solitude of the cellar sounds enticing. And it is. First, a white plate dances with the “five ages of Parmesan in different textures and temperatures”, paired with an orange wine. Massimo explains that he wants the food to “tell a story of tradition in evolution”. Next is “Caesar salad in bloom”, a fresh, light and uncomplicated salad sprinkled with little purple flowers (my favourite). “Emilian tagliatelle with towers of hand-chopped ragu” then enters, paired with beer. The inspiration for the last dish—“bollito, not boiled, prepared sous vide and served with salsa verde and peperonata”—came to Massimo during a trip to New York. When Massimo dashes back to the kitchen, I’m left alone, surrounded by eight chairs and 10,000 bottles of wine. Here I am, in Emilia-Romagna, by myself. As I take bite after simply perfect bite, I realise that I’m still very much in love—this time with the place, the people and the sumptuous food.